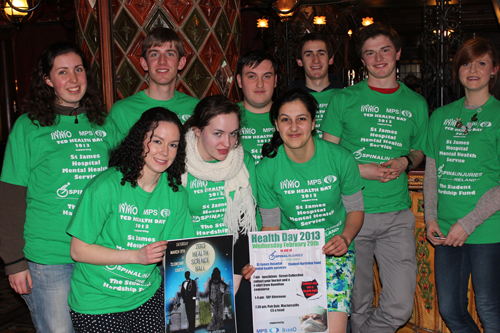 Health Day 2013 took place on Wednesday, February 20th; organised by students from across the Health Sciences Faculty in Trinity College, the day involved a range of activities that included a bucket collection that resulted in their making a donation of €1,600 for the benefit of the Emergency Department. Students from nursing, medicine, physiotherapy, pharmacy, human health and disease and dentistry all participated in the organisation of the day that included the bucket collection for the students’ chosen causes, an open day for secondary school students and a table quiz. The students’ donation is intended to contribute to the cost of upgrading the assessment rooms in the Emergency Department. Jamie Danaher, Clinical Nurse Specialist in Psychological Medicine, says they are all deeply grateful for the students’ interest and for their donation; he explains the background: “Patients who present at the Emergency Department in an agitated or distressed state, and are triaged as having mental health related problems, need very personal attention – and two rooms are provided in the Emergency Department for patients who may need to be accommodated in a separate, private and calming environment for assessment.” Jamie says that this is primarily for the benefit of the individuals involved, but also has a benefit for other waiting patients and staff safety. Jamie describes the rooms at present as meeting the required criteria for staff safety, but says he does not believe they offer patients the sort of calming environment essential to ameliorate distress and agitation. The department’s ambition is to provide a more clinical and calming environment. Jamie says that their aim is to create a more therapeutic and least distressing and intimidating environment for this group. The Emergency Department at St. James’s Hospital provides the optimum care for patients who are victims of sudden illness. 46,190 people presented to the Emergency Department in 2012; 1,851 of these had mental health related issues.